In Part I of this series in honor of @shelisrael and his new book “Twitterville,” I said Twitter is valuable as a “recommendation engine” for interesting Web content. Many people see Twitter as a good way to broadcast messages from your organization, and we’ll get to some of those uses in later posts. But even before you’re ready to take the official plunge into active organizational use of Twitter, you can gather lots of information on what people are saying about your organization. 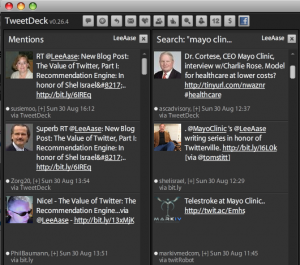 I use Tweetdeck as my desktop productivity enhancer for Twitter for several reasons, as I describe in Twitter 106. (I like CoTweet and Hootsuite as Web-based power applications, particularly for advance scheduling of tweets.) Tweetdeck is great for listening and immediate interactions, and by setting up a fairly sensitive, highly specific search term in one of the panes (as described in Twitter 131) and putting that next to my “Mentions” pane I can see at a glance whether someone is tweeting about me, Mayo Clinic or @mayoclinic. That’s how I met Tom Vanderwell (@tvanderwell) in March, as I described in this post at the time. He had mentioned Mayo Clinic in a tweet on a Sunday night, and because it came up in my Tweetdeck, and because I engaged with him in conversation, it led to us having a real-life meeting in Grand Rapids, Mich. just three days later. What are the odds of something like that happening? I don’t know, but I can tell you for sure that they’re as close to zero as you can imagine if you’re not listening and engaging via Twitter. Tom and I connected a couple more times in subsequent months…the first of which was when he joined us by phone for Tweetcamp II. A month or so later, when I was looking for examples of small businesses using social media, we interacted again by Twitter, phone and email, which led to this post. We connected again earlier this month, when I traveled to Tom’s hometown of Grand Rapids to celebrate my granddaughter Evelyn’s first birthday. I tweeted Tom in advance, asking if he would be willing to get together so I could interview him for a couple of stories, and he quickly agreed. So on Evelyn’s birthday, two weeks ago today, I stopped over at Tom’s home and interviewed him with his own Flip video camera (he had taken my advice from our March meeting and got one!) about his experience as a Mayo Clinic patient, and how he has used blogging and Twitter for his business. Tom’s Mayo Clinic interview is here on our Sharing Mayo Clinic blog. The next post in this series will feature Tom’s perspectives on Twitter, and later I will have another post on Tom’s use of blogging. I’ve made a personal friend. Tom and I have a lot in common, as we’ve discovered in our two face-to-face meetings and via our electronic interactions. I’ve learned from someone who is using social media in another industry, and how he is finding social media practical and profitable. And I’m getting to share those insights with you. I’ve met a Mayo Clinic patient who was enthusiastic about sharing his experiences on our Sharing Mayo Clinic blog. That’s a lot of value for my investment in Twitter…and it’s only one case study. I got an invitation last week to upgrade my HootSuite account to version 2.0, and I’m really liking what I see. 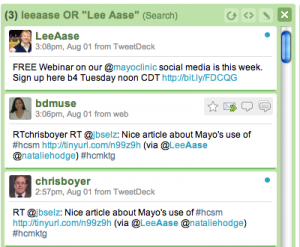 I’ve long appreciated the ability within Hootsuite to pre-schedule tweets, and to manage multiple Twitter accounts. So, for example, when I was doing an event (such as Tweetcamp III), I have scheduled tweets for various times throughout the course of the presentation, to include links to particular items I was referencing. It’s particularly helpful for highlighting key Web sites or blog posts when part of the group is participating remotely. And in the middle of a presentation I have to stay focused, not taking a minute to send a tweet. The “columns-to-go” feature lets you create a widget based on any search in Twitter, to incorporate within a blog post or your sidebar. So I created the widget above based on a search for “leeaase” or “Lee Aase” and put it within my SMUG sidebar. The ability to set automatic Tweets from an RSS feed. I used to do this using Twitterfeed for our @mayoclinic account. This is a good way to make sure each of our new Sharing Mayo Clinic blog posts gets tweeted at least once, because I know we’ve forgotten to tweet some of them. I think it’s especially OK given the fact that we are highly personally interactive in our Twitter account. Turning this feature on through Hootsuite was a lot easier than Twitterfeed, which had a complicated OpenID process when I used it, although it may have improved in the intervening months. The statistics package seems pretty strong. You need to use the Ow.ly link shortening built into Hootsuite to take advantage of this, but that doesn’t seem to be a major burden. I look forward to seeing how that works. Multiple Users. It seems this was added to keep pace with CoTweet, which lets multiple users tweet from the same account without sharing the username/password. This is a benefit because as administrator you don’t want to give every user the master password, because that could enable a disgruntled employee to change the password and lock you out of the account. Twitter’s open platform that enables outside programmers to add new functionality is one of its best features, and I think Hootsuite has made some significant advances to incorporate a lot of the best features in some of the desktop clients and Web-based platforms for Twitter. What tools do you find most helpful in making Twitter more productive? RAQ – Why are Auto Direct Message Replies in Twitter Bad? Thanks for the follow! I’m so glad we’ve connected. Looking forward to your tweets. This was sent by a robot, not a person. And it’s a step away from what Twitter is all about, which is real conversations with real people. A SMUGgle recently asked, “So why are these automatic direct messages so bad?” So in keeping with our “Recently Asked Questions” format, I’m answering here to make it available to everyone. And if others have additional comments or reasons (or even a contrary opinion, though I’m doubtful of that based on the reactions I saw in in the #Tweetcamp3 stream), please add them in the comments below. The thank you notes we received from two grads, whose open houses were held he same day, illustrate why auto direct messages to new Twitter followers are a bad idea. But while “Tim’s” was written by hand, “Mark” had photocopied the text and pasted it into the card, and then just signed his name. Which do you think gave us a warmer feeling? When someone new follows you, it’s not necessary to send a direct message to acknowledge it. It’s better to not acknowledge a new follower than to have a machine do it for you. Save your direct messages for personal, special communications. Many users choose to have text messages sent to their phones when they get direct messages, so if you are sending an impersonal “form” tweet as a direct message you are likely alienating followers. If you want to acknowledge your new followers, do it personally, either through a direct message you write based on having checked their profile and tweets or, better yet, through an @ reply that indicates to your followers that this person has interesting things to say. Twitter is a person-al medium. Let’s keep it that way! What do you think? Do you have other reasons why auto d messages in Twitter are bad? Or do you think there is any place for them? Author Lee AasePosted on July 21, 2009 Categories Chancellor RAQs, TwitterTags direct messages, follow, followers, Lee Aase, Tweetcamp, Twitter5 Comments on RAQ – Why are Auto Direct Message Replies in Twitter Bad? Normally when you hear a warning like that, the implication is that the task should only be done by a trained professional, not by amateurs. I had a different experience of this admonition today as we were getting ready for Tweetcamp III. 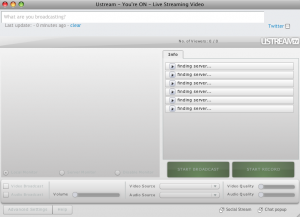 Instead of using a phone conference call or professional video Webcasting, as we had done for our first two tweetcamps, I thought it would be great to do this one via uStream.tv. I even tested it “at home” Saturday night, with my very first ChancellorCast embedded here on SMUG. It said it was “Finding Server” but the reality was different. So after trying to get through for about 7 minutes, at 1:59 CDT I decided we needed to revert to the audio conference method…and after a few hiccups with getting the right number and authorization code, we were able to get going about 2:13. In some ways it was an interesting audio representation of the “Tribe” that had gathered, because for the better part of five minutes we had a popcorn-like sound of beeps as new callers joined. It also showed the power of Twitter, in that by using the #tweetcamp3 hashtag we could get word to almost everyone, and switch probably more than 100 participants from video Webcast to phone conference in less than 15 minutes. My takeaway: “Don’t try this at home” has a second meaning beyond the traditional. Just because something works at home in testing doesn’t mean it will work in a presentation. It’s important to do a run-through in the exact room where the presentation is taking place, and using all of the technology that will be used in the actual event. I don’t like to give out the presentation in hard copy, because I want to have people looking at me and the screen instead of their laps. I don’t want them reading ahead either. By having the presentation on Slideshare, I can tell them where they will be able to refer later, and we can just engage in discussion. In a pinch, I can present from the Web instead of my computer, so if for some reason my computer doesn’t talk nicely with the LCD projector I can use one that does. It’s what grandpa used to do when he would wear both a belt and suspenders to ensure that his trousers stayed put. It’s good that we had audio conferencing as another option. It would have been better to try the broadcast from within the room when I arrived there about 25 minutes before the program’s scheduled start. 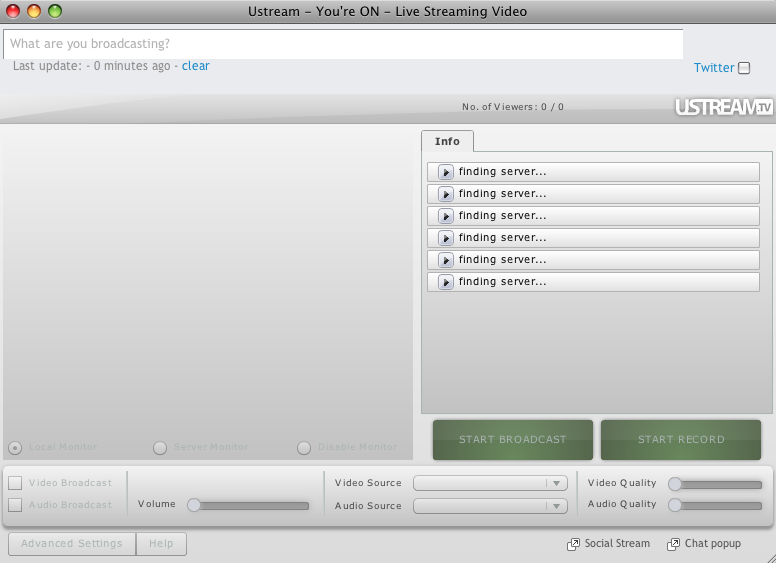 I just though that since I could get to uStream.tv from behind the firewall I wouldn’t have any problem connecting to the Video server. And let this be a lesson to you, too. Thanks to everyone who participated in Tweetcamp III today. I hope you found it helpful and worthwhile. I look forward to going through the #tweetcamp3 tweets and seeing what I can learn. I won’t thank you for your patience, because I don’t know whether you were patient or not. Maybe you were secretly stewing. But at least nobody flamed me. So I’ll thank you for that, and for hanging in as we worked out the kinks. Update 8:45 p.m. 7/13: I was able to record the video Webcast tonight, so now I think the Tweetcamp III post is a nice archive you could share with people you want to introduce to Twitter.